Climate change poses multiple challenges to development. It affects lives and livelihoods, infrastructure and institutions, as well as beliefs, cultures and identities. There is a growing recognition that the social dimensions of vulnerability and adaptation now need to move to the forefront of development policies and practices. This book presents case studies showing that climate change is as much a problem of development as for development, with many of the risks closely linked to past, present and future development pathways. Development policies and practices can play a key role in addressing climate change, but it is critical to question to what extent such actions and interventions reproduce, rather than address, the social and political structures and development pathways driving vulnerability. The chapters emphasise that adaptation is about much more than a set of projects or interventions to reduce specific impacts of climate change; it is about living with change while also transforming the processes that contribute to vulnerability in the first place. 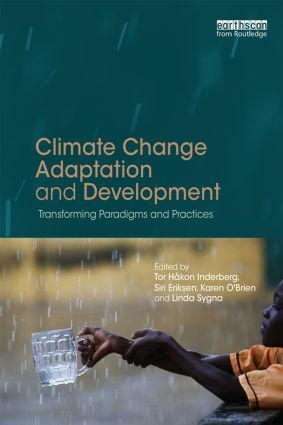 This book will help students in the field of climate change and development to make sense of adaptation as a social process, and it will provide practitioners, policymakers and researchers working at the interface between climate change and development with useful insights for approaching adaptation as part of a larger transformation to sustainability.